Service One is a customer-owned financial services provider – owned by the people who save and borrow with us. Service One’s local approach means they can react faster to members’ needs and they’re known for their personal, friendly approach. 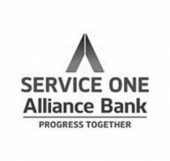 Service One offers a range of financial products and services including a full range of housing loans, personal loans, credit cards, deposit accounts, investment products, insurance, financial planning services and more.